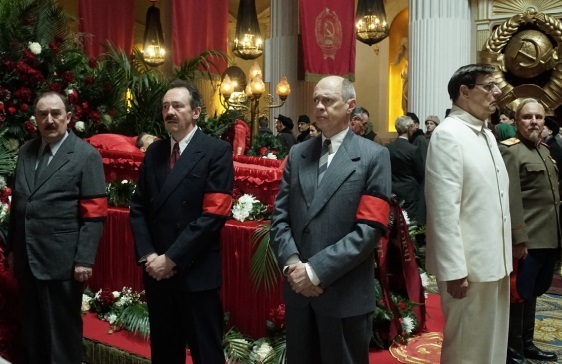 Director and writer Armando Ianucci’s politcal comic satire, The Death of Stalin, is probably more noteworthy for those who will not be able see the film than those who will. US audiences are limited at best, and if filmgoers in smaller markets have an interest, it’s more than likely they won’t find a theatre at the multiplex showing it; they’ll have to wait for the DVD, or stream the film once it becomes available to subscribers. But at least, in one format or another, they’ll eventually have the chance to judge things for themselves. Not so in Russia or some of its former Soviet Union member countries. When seen at private screenings, the head of the Russian Great Fatherland Party considered the British comedy as an unfriendly act by the “British Intellectual class.” Two days before its official release, the film was withdrawn for public showing. For the record, a few theatres actually went ahead and screened the film, claiming they were unaware of a ban. A lawsuit by Russia’s culture ministry filed a lawsuit against them. Perhaps a curiosity you never had before is now piqued. If so, read on. If not, The Death of Stalin is not for you. Despite the satirical approach, the film depicts real events with a screenplay based on a French graphic novel of the same name. In Moscow, 1953, dictator Joseph Stalin (Adrian Mcloughlin) was paralyzed by a cerebral hemorrhage. He suffered a massive stroke and died days later. What follows is the behind-the-scenes power struggle between the high-ranking members of the Soviet security and secret police, plus Moscow’s associate leading rulers, all vying for power, or at the very least, making sure their backsides are covered. Like the Keystone Cops bumping into each other with every move, the bumbling members of the Central Committee discuss, argue, and take whatever action they deem necessary to keep the country moving, including saving their own skins. 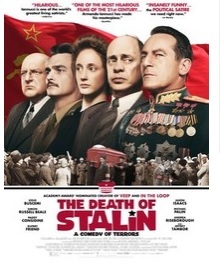 Once Stalin finally dies, the NKVD (People’s Commissariat for Internal Affairs) execute witnesses while guiding Deputy General Secretary Georgy Malenkov (Jeffrey Tambor) to take leadership, believing he could be used as a puppet in order to bring about the kind of changes the NKVD desires. Perhaps the film’s major problem is having audiences know who all of these real-life characters are. Their personal conflicts as they attempt to either grab power or simply keep themselves alive is initially funny, but having to constantly remind yourself who’s who, and trying to work out exactly what their personal motives are, is taxing; you’re too busy trying to make sense of things. The humor comes in the absurdity of what the committee members are trying to achieve and how they go about it. Monty Python’s Michael Palin plays Vyacheslav Molotov, once a protege of Stalin and now Foreign Minister. At the beginning of the film, he doesn’t know it, but he’s on one of Stalin’s enemy lists and will soon be executed. 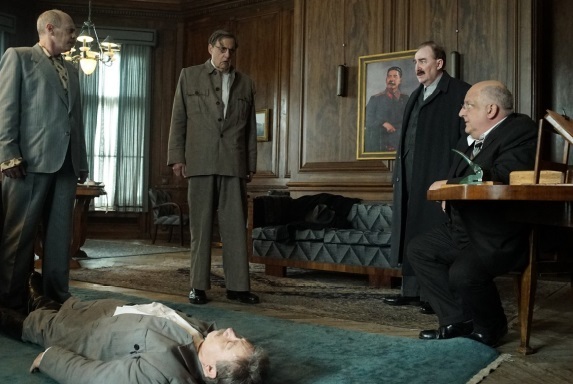 Once Stalin dies, the NKVD makes its own enemies list, saving Molotov’s life, yet when Nikita Khrushchev (Steve Buscemi) tries to enlist Molotov’s support for the changes to come, Molotov resists. As a true believer in Stalinism (despite being aware that the dictator was about to have him disappear), the Foreign Minister opposes any changes within the party. It’s only when his wife is released from internal exile, sent there for treason by the secret police, that the minister changes his mind, though as portrayed in the film, he’s not altogether comfortable with her freedom. There’s an improvisational style to the f-bomb laden film, much of which comes about by director Iannucci allowing the actors to speak in their English regional dialects rather than having them imitate comic Russian ones. Besides Tambor and Buscemi’s American accents, having Stalin bark orders in London’s East End cockney simply sounds funny. Best of all, however, is Jason Issacs, perhaps more popularly known as the villainous Malfoy in the Harry Potter films. 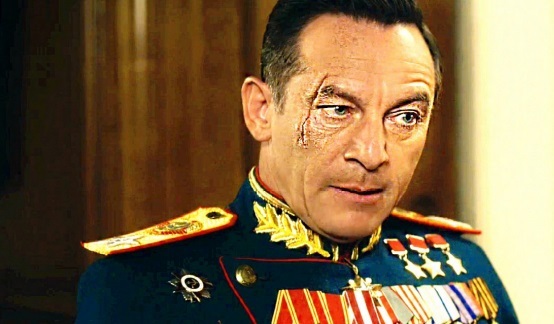 It’s practically an hour into the movie until Isaacs makes his entrance as Soviet Red Army officer, Field Marshall Georgy Zhukov, but when he does, he bursts through the doors and into the scene with the power of a whirling cyclone, injecting a fresh sense of energy into the proceedings just at the moment when the sagging and somewhat confusing narrative needs it the most. Though the actor’s background is Liverpool, Issacs delivers Zhukov’s dialog with the thick, unrelenting accent of Yorkshire, and it’s hilarious. Even British audiences, once they’ve stopped laughing, will need a moment or two of adjustment to the sound. If only he had burst through those doors sooner.